Size : Small RRP £45. Fitted fit. Reflective details. Pre-shaped knees. Add the highly reflective material to the lower leg and the tights benefit from 360 degree reflectivity. Rear pocket that can accomodate a gel or small smart phone. Flat lock seams-train in comfort. 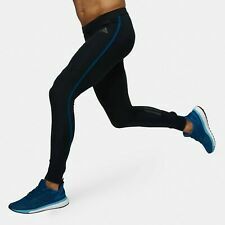 ADIDAS TEAM GB RIO 2016 ELITE ATHLETE OLYMPIC PRESENTATION PANTS Size 38"
ADIDAS TEAM GB RIO 2016. ELITE ATHLETE OLYMPIC PRESENTATION PANTS. SIZE:- UK 38" F192 E192 D8 I8 J 2XO. Zippered pocket with vapor barrier on the back-right hip for secure, protective storage. Dri-FIT French terry fabric wicks sweat away from your skin to the fabric's surface—where it quickly evaporates—to help you stay dry and comfortable. Size large. Waist 30"-38". Two pockets. Waist 27"-34". Several dirt marks on front, no holes. But keeping the perfect form is just as important as the drive to do more. Those aren’t just on the UA Perpetual Powerprint series, they’re actually designed to help support and guide your muscles. Strategically placed Powerprint taping increases muscle awareness with dynamic flex & support. Outer material is polyester. Inner material (liner) is cotton. The cotton liner gives a nice soft feeling. The polyester outside protects from wind and spray. Very good quality. Good seams, well taylored.